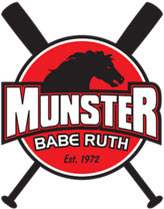 Munster Babe Ruth will again be sponsoring teams to parcipate in the 2018 College Recreational League for players aged 19-28. Teams of at least 16 players are invited to parcipate. Munster Babe Ruth regular registration fees for Munster and out-of-town residents will apply. There are no signups for individuals to be placed on a team. Games may include travel to other south Chicagoland and NW Indiana locations. Some teams may consist largely or entirely of active college players so the level of competion should be considered. Managers with teams of at least 16 players may contact Commissioner Ed Becher at edbecher@aol.com or call/text to 219.629.6923 for additional information.